The kribensis cichlid, also known as krib, is the most famous type of cichlids. 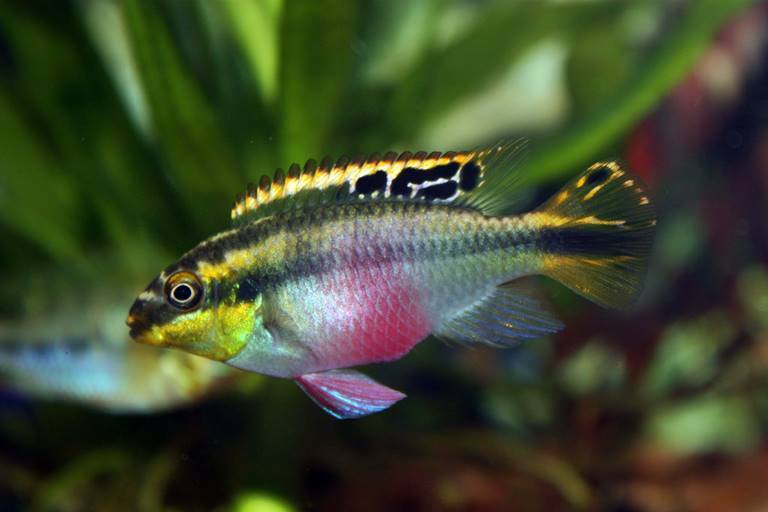 This is because the kribensis cichlid is known to be resistant to all sorts of water conditions, which include factors such as temperature, freshness and availability of food. The maximum height of an adult kribensis cichlid is approximately 10 cm or 4 inches, where the males are ideally a few centimetres more in length than the females. This categorizes the kribensis cichlid as a dwarf cichlid. Under perfect care, these fish have a lifespan of five years or even more. They are very colourful, and their colours become even more prominent when they are given good care. 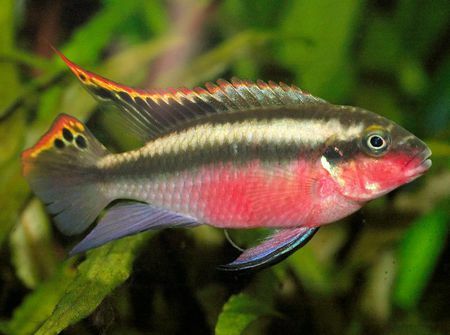 The kribensis cichlids tend to develop a purple or red region around the abdominal area. 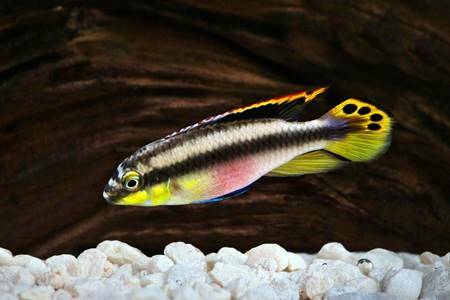 These characteristics make the kribensis cichlids very high in demand among hobbyist aquarists. 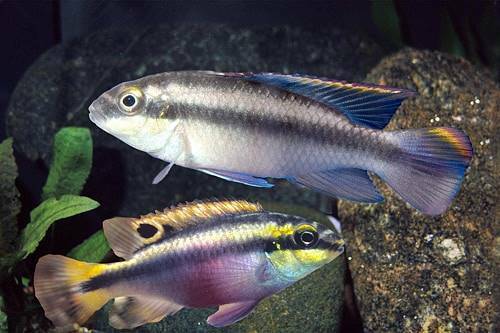 The kribensis cichlids are said to have originated from the Nigerian rivers in Africa. In particular, the fish are said to be natives to the Ethiopian rivers around the outflows of the River Niger Delta. 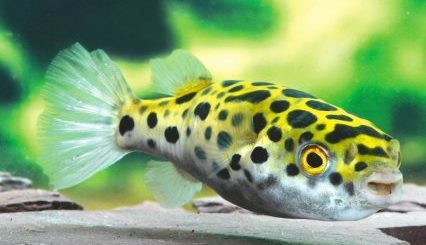 This breed of fish prefers living conditions that are restricted to Africa, mainly West and the West Central African regions. This fish typically has a habitat that ranges all the way to Cameroon, Nigeria and Benin. 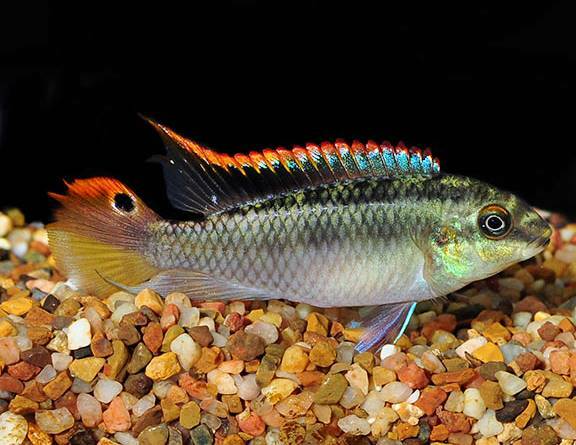 It is a common myth that the kribensis inhabits brackish waters; in reality, it is found in deltas that stretch from 150 kilometres inland to the sea. It is only present in soft, fresh waters and not in brackish conditions. All evidence of their habitat shows that kribs are freshwater fish, and brackish waters are unsuitable for their sustenance. The kribensis cichlids present in different parts of the river have different sizes. The shallowest part of the river contains small kribs and a sizeable number of females. The male-to-female ratio in this part of the river is highly mismatched at 1:2. A reasonable explanation for this is that this tactic helps the kribs by protecting them from predators such as ashydrocynus, hepsetus and lates. The shallow waters, which are only a few inches deep, provide a secure habitat to the young kribs and the females. The waters which the kribs inhabit are fast moving. The speed of the rushing water can range from between 10 cm (3.9”)per second to 50cm(19.7”) per second. This speed is higher than most aquariums, but compared to whitewater areas, this speed is much slower. It is best for kribs to have other fish in the tank as they tend to get aggressive around their juveniles and when they are spawning. If there are other tank members, there should ideally be two couples of the kribs in the tank as this would reduce their aggressiveness. By doing this, the fish do not fight and show their colours at the edges of the tank. Interestingly, the kribs tend to clearly divide their territory with the other fish, marking their home territory and that of their rival. Furthermore, they mate at the borders of this territory as a method to show their strength and colours to the rival fish. The kribs are particularly fond of small gravel and sandy bottoms at their tanks, which they dig into. These tank bottom substrates are considered to be as important as caves, pipes and other knick-knacks. It is also strongly advised to keep the tank covered as the kribs are considered an active breed. There is a common misunderstanding that the kribensis cichlid is an omnivorous species. It is a strictly herbivorous fish and its diet consists of a variety of algae. Strangely enough, it also ingests sand, although it is unclear what nutritional value or benefit is provided by it. 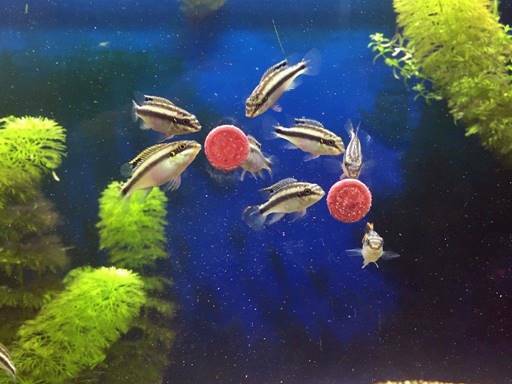 As per various experiments carried out on wild fish to determine their dietary habits, the majority of kribensis cichlids had a high percentage of plant matter, which includes stems and fragments of leaves. It is to be noted that crustacean food was found in only a quarter of the kribs experimented on. 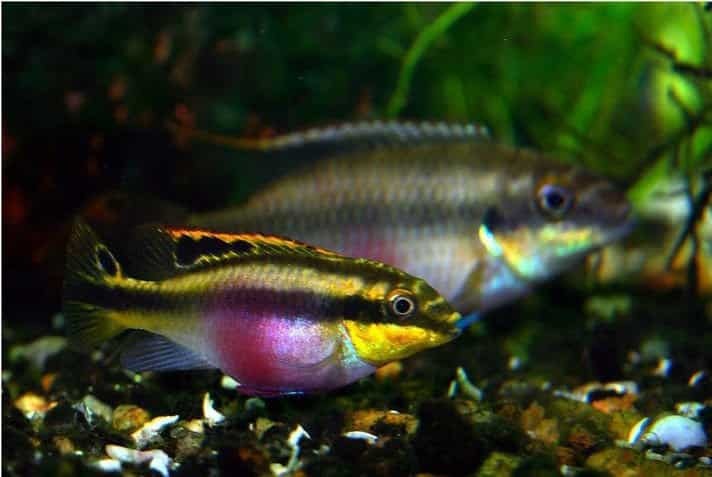 The study showed that a surprisingly high percentage of algae was found in the bellies of the kribensis cichlids, which was contrary to the common perception. The highest percentage was for the diatomaceous algae along with the plain green and blue-green algae. It is to be noted that sand was also found in each and every krib. This shows that sand was ingested as the fish were searching around for detritus and algae. It is also suspected that the kribs even ingested the biofilm present on each sand grain. Kribs being kept in tanks should be given plant-based or algae food, and the main ingredient should not be fish. If their food is being bought from a supermarket, green supplements can be given to the kribs, including flaked peas, blanched spinach and other seaweed-based products. In addition, nori seaweed can also be given to kribs. Just be sure to give a lot of plant-based food instead of living fish as the kribs have been found to be herbivores in the wild. The kribensis cichlids have a reputation for being easy to keep in tanks and easy to breed. Hence, you will not have a lot of problems taking care of them. The basic conditions they require for breeding are clean water. If they are conditioned a few weeks before the upcoming event, it would only prove ideal for their breeding. The kribs are considered to be very protective parents. They nurture their offspring and protect them from all intruders. In order to carry out breeding in a tank, you would need to place cave-like structures and pipes where the kribs can hide. Commonly, the female fish initiates the breeding process by hinting the male krib via its pink belly and moving its body and fin. The females tend to shake their bodies and wave and curve their fins. It can also be observed that the fish couple may throw some of the gravel out of the cave before they start mating. This is an attempt to make space for the future eggs and babies. After mating, the female fish would generally lay anywhere from forty to one hundred eggs in the pipe or cave where they bred. They would then protect the eggs, and the male would protect the babies. The eggs start hatching after 5-7 days, and it takes the fry another five days to be able to swim. The female fish might even stay inside the cave during the whole period. The fry can be fed a lot of things, including powdered flakes and baby brine shrimp. If a single parent gets aggressive around the babies, which they tend to be, the aggressive fish should be removed from the tank. Over a period of about two to four weeks, Krib juveniles may grow up to a height of half an inch or about 1.25 centimetres. Despite the small size of the kribs, it should be kept in mind that they are still cichlids and hold some aggressive traits. Therefore, the tank members should be chosen with care and seriousness. It is commonly observed that the tank members of the kribs tend to be stressed out, so it is recommended to keep kribs alone in the tank. 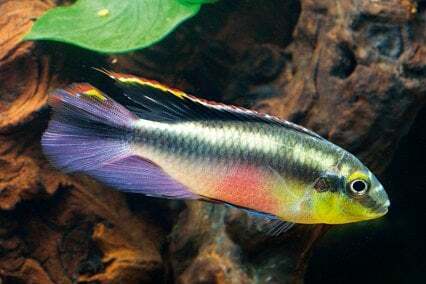 The kribensis cichlids may even bite some of the small and slower fish in the tank, though this can be a rare occurrence and may only occur when the tanks are small in size or when space is too crowded. The kribs have a tendency to mark their territory, especially when they are spawning. They are known to push the other small fish to one side of the tank and make them stay there while they spawn. Although this is a harmless practice, this shows the dominant nature of the fish. If you do want to keep tank mates with kribs, choose one that doesn’t make a lot of fuss. 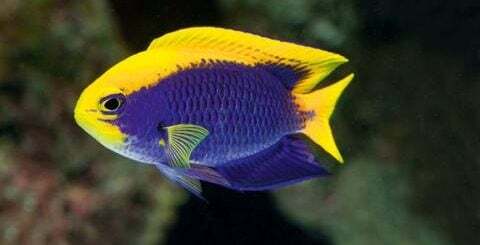 An example of such a fish would be the angelfish, which can be dominated by the kribs. The most common problem for the krib is the ich, which can either be treated by increasing the tank temperature or feeding it copper-based medicines. It is important to maintain copper levels in the tanks. The proper copper level should be maintained very carefully and exactly like how the manufacturers’ suggestion order to reduce the chances of your kribs getting ich. These fish are also prone to parasitic infections, including worms and protozoa. 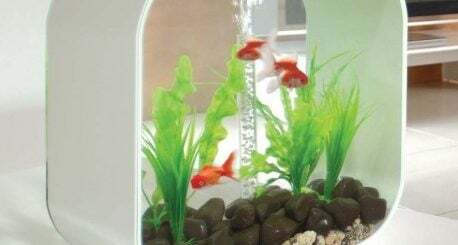 The fish diseases can be avoided by maintaining the tank temperature, not overfeeding, providing hiding places and ensuring that the tank water quality is kept clean and the water is not stale. In case of any ailment, it is crucial that it is treated timely. BiOrb Fish Tank – What it is? Details Inside!